what am i craving this fall? plaid! plaid shirts, plaid skirts and everything in between! 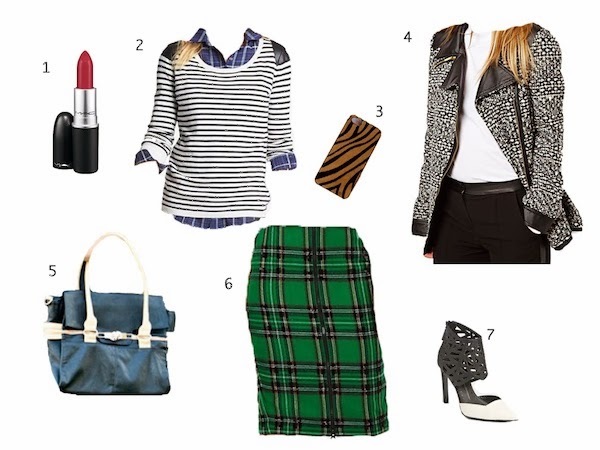 these are a few favorites this week that work perfect together to create a fabulous must-have fall look! hope you're all having a great week so far! my baby girl turned 1 month old yesterday and it had me freaking out a little bit...time is going by too fast already!! I am dying over the mix of plaid and stripes. I've seen it a lot this year! Need to get my hands on it asap! I love that plaid skirt!! So cute. Shoes are fabulous and fierce! Great picks! Love that jacket!